There is great potential for the Dutch food security agenda to be more effective when a food system approach, the ambition of leaving no one behind and local knowledge gain a more central role. This was the main conclusion from the multi-stakeholder dialogue on the recent IOB evaluation of the Dutch food security policy. In particular, prioritizing consumption over production, striving for inclusive transformation, designing PPPs as transformative engines for public goals and taking into account environmental and resilience impacts of each intervention were seen as the best ways forward. What should be done more, less or different in the Dutch food security agenda? The public dialogue organized by the Policy and Operations Evaluation Department (IOB) of the Ministry of Foreign Affairs (MinFA) and Food & Business Knowledge Platform (F&BKP) on May 31 sought answers to this question. 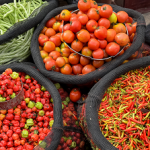 Reflecting on the IOB “Food for thought” review, researchers, non-governmental organizations (NGOs), policymakers and representatives from the private sector formulated their recommendations for the coming years of Dutch food security policy. In her plenary introduction, IOB director Wendy Asbeek-Brusse wondered how today’s wisdom, after 170 years of industrialization, has yet been unable to solve the problem of food insecurity – referring to the name of the venue, the Wisdom and Wonder Pavilion, set up to celebrate 100 years of Wageningen UR. Underestimating ”evaluation” as a tool for policy improvement is a missed chance in this regard. Reminding everyone that food security is a spearhead in international development policy, much could be gained from the day’s discussion results. Plenary debate leader Adrie Papma (chair Steering Committee F&BKP) shared with all participants the key objective of the day ahead: based on their valuable experiences and knowledge, come up with recommendations for a policy that builds on the findings of the IOB, works towards sustainable and inclusive change and takes into account limitations of available (financial) resources. First, Ferko Bodnár (the IOB lead evaluator on “Food for thought”) presented the main findings of the IOB review. Bodnár emphasized three out of a total of eleven policy recommendations: distinguish different farmer types, use a food system approach that does not start from production but from consumption and assure synergy between different activities instead of working on small individual “islands”. In the plenary panel that followed, with representatives from the private sector, NGOs , knowledge institutes and policy, Maaike Groot ( East-West Seed) emphasized the importance of a broader approach: “Beware of solutions that increase food production but do not improve food security for the poor”, she said. 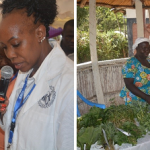 From her perspective, knowledge exchange and training of trainers (in the vegetable sector, for example) is key to helping local farmers in targeted areas apply simple techniques and can make a great contribution to climate resilience, improved nutrition, employment or an enabling business environment. She also supported the assisting role of embassies in carefully choosing target groups, partners and modes of engagement for (private) actors that want to contribute to the food and nutrition security agenda. This resonated well with the appreciation Katie Minderhoud (Solidaridad) gave to the IOB’s call for policy coherence. She favours a holistic approach but emphasized the need to zoom in on where interventions can have the most added value and be chosen by the local people and grounded in their reality. Based on that starting point, she called for improved policy understanding on what the private sector can contribute, and what kind of policy environment is necessary for them to truly deliver on food security. Ken Giller (WUR) passionately emphasized the need for integrated strategies based on local conditions, including serious impact monitoring. In actual Official Development Assistance (ODA) supported value chain development programmes, there is too much emphasis on the role of the (Dutch) private sector with the poor tending to be left behind, even though the projects in themselves are successful. Companies might be investing for the less short term, but are inclined to focus on geographical zones that provide good terms and infrastructures and serve maybe only 5% of the population, a population that is often already better off. Dutch policy should chose difficult areas where poor people live. Agriculture has a lot of potential to contribute to improved food and nutrition. For example, targeting women via extension services has shown very good results. Paul van de Logt (Ministry of Foreign Affairs) reacted, noting that indeed the new Dutch Foreign Trade and Development Cooperation policy will work from coherent country strategies, tailored to local needs. The focus will not isolatedly be on food security, but instead other themes will also be addressed, such as land rights and enabling business environments, where the Netherlands could play an added development role. Within such a strategy, considerations should be made about with whom to cooperate, in what kind of partnerships and which of the IOB mentioned farmer groups to target, for example via extension services – of which he also underlined to be in favour of. All in all, the participating panellists warmly welcomed the IOB suggestions and, despite their different backgrounds, agreed on broader coherent approaches based on specific context realities to improve the Dutch Food and Nutrition Security policy. The subsequent question about what this would more precisely look like and what dilemmas should be tackled, was discussed in four breakout sessions. In the session on food and nutrition security participants discussed how to make interventions based on a food system approach practically “clever” and recommended having a clear nutrition goal and choice of target group as a basis for appropriate interventions. In addition, the perspective of the food-insecure consumer needs to become far more prominent in policy design and implementation. The session about inclusive agricultural transformation brought the discussion back to how to be inclusive when anticipating agricultural transformation. Solutions were sought in successful examples of investing in infrastructure and inclusiveness of vulnerable groups in agri-value chains. The session on public-private partnerships (PPPs) focused on better institutionalization of PPPs’ public goals to contribute to food and nutrition outcomes, which might have been overlooked in their design in the period evaluated. Participants in the discussion were confident that these development objectives -in a broader perspective- should be put more central, and PPPs seen as transformative, rather than as financial, instruments. The session on environmental sustainability of food systems stressed the need to include environmental (including climate) impacts in the design of any project. Additionally, it emphasized that Dutch policy needs to contribute to the sustainability and coherent resilience of both food production systems and ecosystems, agreeing that both systems have the potential to mutually reinforce each other. A long-term perspective and investment in locally owned programmes is needed, even if particular projects may have a shorter duration. Overall, the participants agreed that a broad coherent food system analysis should be at the basis of future interventions. This should be locally oriented and embedded, be transformative, and lead to concrete food and nutrition outcomes. With these reflections plenary shared, the floor was given to policy representatives for their reactions on the rich input of the morning. Geert Westenbrink (Ministry of Agriculture, Nature and Food Quality) started by emphasizing the “good news” that under the new policy, his ministry wants to continue working on food security. From the morning outcomes he underlined that this agricultural development policy should look at the whole food system. It needs to put equal emphasis on, for example, agricultural jobs in addition to food itself. The need to take local realities into account was again echoed in his words, in addition to highlighting “turning the food system around” by putting consumer’s nutrition security as well as environmental sustainability central. Paul van de Logt (Ministry of Foreign Affairs) thanked everybody for their valuable input. He took away two main messages for his ministry to continue working on, whereby he added that the IOB evaluation concerns activities of all actors present at the dialogue. “Currently”, he admitted, “we do not look at the food system enough.” Adding that we have to know the system we want to intervene in to define our own added value as the Netherlands. Secondly, he emphasized that value chains will not deliver Food and Nutrition Security goals by themselves. Nutrition and environmental outcomes should be taken into account much more in all the projects his department, Inclusive Green Growth, supports. He pointed out that for that to happen, a clear transparent results framework is needed, as well as continuous evaluation of the assumptions that underlay such a framework. Worku Tessema, food security policy officer at the Netherlands embassy in Addis Ababa, stressed the dilemma of implementing all these good policy intentions. How will professionals on the ground, such as at embassies, make a distinction between farmers who are “hanging in” and those “stepping up”, for example? A holistic approach by those actors is essential to including all farmers, he said. Please find here the full evaluation report and all related documents. Please watch the general video impression of the IOB public dialogue. Read the blog of session 1 – Turning the food system around to achieve inclusive nutrition security. 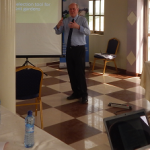 Read the blog of session 2 – Making agricultural transformation more inclusive. Read the blog of session 3 – Future PPPs: transformative engines contributing to public objectives. Read the blog of session 4 – Steering towards greater resilience of food production systems and ecosystems.